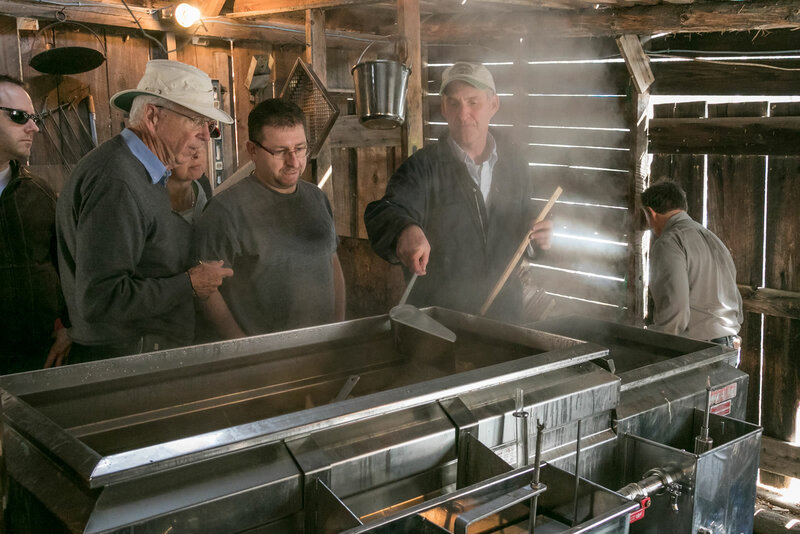 At Fortune Farms we take the time with our visitors to explain the art and science of maple syrup making. During the season we boil fresh sap nearly every day to make syrup. We also make maple candy and maple “butter”. You can see the full process on the Tree to Treat flowchart. After a walk in the sugar bush along an interpretive trail and then back to the sugar camp to enjoy fresh taffy on the snow. The Fortune family will do their best to make your visit to the sugar bush a tasty and educational experience. Our visitor book shows visitors from many foreign countries. Several of these visitors were making their first trip to Canada to see our forests and enjoy a maple experience. Some of the more distant countries are Australia. Singapore, Switzerland, Brazil, Korea, Japan, Taiwan, New Zealand, Russia, Norway, England, Ireland, France, Belgium and Germany. Of course most visitors come from Ontario, but visitors have also come from every Province and Territory in Canada, the United States and Mexico.